← What’s the Cure for Despair? An electronic church sign. They’re expensive and they scream “Please Notice Us.” And not in a good way. Social media is free. Use it. Screens in the sanctuary. If screens will help people participate better – great. But if we install screens “because the young people like them” we are missing the point. Drums/Tambourines/Guitars in Worship – again – if done for the sake of “attracting the young people.” It’s not about the instruments. It’s about the relationships. Powdered creamer for coffee time. If you add cream to your coffee, you know why. Make an effort. Offer half and half. And almond milk. And fresh lemon for tea drinkers. Yellow Pages Advertisements. For the love . . .
Manuals of Operations Longer than Ten Pages. It’s easier to come up with no-coffee-in-the-sanctuary policy than it is to talk about the spiritual maturity of the congregation. Don’t distract yourselves with regulations. Visitor Parking Spaces. No. Most visitors do not want to stand up and identify themselves in worship either. Historical Rooms. Some congregations have multiple spaces dedicated to the rich past of their church. But this implies that the past is at least as important as the future of a spiritual community. I love history. But there are hundreds of tourist sites in Europe that used to be churches. What makes a Church thrive? Authentic community. Serious discipleship. Radical hospitality. Making a personal effort to love people who might not love you in return. Addressing what breaks God’s heart in the neighborhood in the name of Jesus. This is obviously old news for the last Wednesday before Advent, but as congregations are making plans for 2019, it’s worth repeating. *Okay, there actually is a capital S Savior. Image from Amazon. You can buy this on Amazon but I hope you won’t. 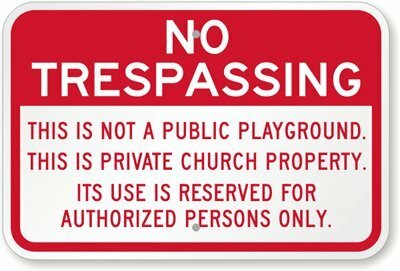 I saw a “Thou shalt not skateboard” sign at one church. Did you pick up your skateboard? The china item made me laugh outloud. Our Westminster congregation had dinnerware with its name misspelled–Westminister. Since we only use disposables now, I suggested we dispose of the china. (and crystal luncheon plates that took up massive amounts of storage) Most agreed, but it was a younger group that said they stilled used those misspelled plates and ran them through the dishwasher. Now the very old commercial dishwasher has quit working! In the first years of my membership at former church, noticing they had china from their original building that they never used, I suggested we get a dishwasher so the china could earn its storage space. They got rid of the china. Now, 30 years later, they’ve installed a dishwasher. Still going by the bottom line, though: turns out running the dishwasher costs more than buying disposables. If the budget bottom line is all that matters, of course. Seriously, this is a great post. My church wants to put their energy into the past rather than the future. Powdered creamer for coffeetime? How about let’s start with actually having a weekly coffeetime? Kathryn’s church recently added video monitors to enable multimedia elements in worship, along with upgrading their sound system. The benefits have been enormous and the response positive across generations. I’ve long been a holdout on screens in worship, so I was surprised at how much having the monitors adds, even when used sparingly. I’m with Martha. I’m a convert to screens. I never needed to be converted to the guitars and drums. I love our church band passionately! And we are an OLD congregation. But we rock out on Sundays. Screens save paper and we are committed to sustainability. Also why we don’t use any disposables at our church – even use cloth napkins and cloth towels in the bathrooms. But the china … just no. Corel. Thank you, Jan for this insightful list. I’m going to present it to my church as their new pastor.